In Ireland, fairies (aka faeries) have always been around. We have evidence of them dating back centuries, and new signs of their activity are constantly being found. Magic is one of our Irish gifts, after all, along with the ability to spin a compelling and imaginative tale that everyone sincerely wants to believe. While fairies are enjoying a new level of popularity in North America, they have always ruled the countryside in Ireland. But that’s not say they haven’t made an impact in urban areas too. After all, Irish people in large cities and tiny villages all know someone who they describe as being “away with the fairies”. It’s not an insult, just an acknowledgement that an individual is operating in a realm than most of us, a realm where magic is just one of many Irish gifts they enjoy. So what exactly is an Irish fairy? It’s hard to say what they look like because they are rarely seen clearly. They prefer to keep away from humans. If they do encounter a human in daylight, they will hide or change form. Irish fairies often take the form of a hare. But we do know they are small. They should not, however, be confused with leprechauns or pookas, Ireland’s other resident small, magical beings. 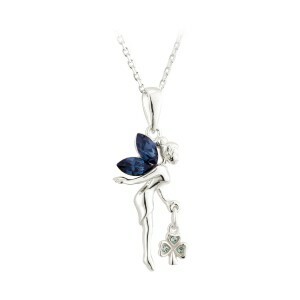 You will see leprechauns on more Irish gifts, but fairies are just as Irish as leprechauns. Fairies live underground, in trees and in ring forts. These fairy rings can still be seen around Ireland. Even before we had laws about where one can build, it was common knowledge that building too near a ring fort or other fairy dwelling was inviting disaster. We tend to think of fairies as being sweet and good, but they can become extremely angry and vindictive if treated with disrespect. That’s why in the days before modern indoor plumbing, if someone had to empty a bucket of water outside, they would shout a warning so any fairies would move away and not be soaked. You can still see fairy forts dotted around the fields of Ireland. You will also notice tiny doors on many trees in Irish parks. These are fairy doors. Traditionally, fairies chose to live in single trees that stood alone in a field. That’s why so many are still standing. Farmers know better than to chop down a fairy tree. But like many humans in Ireland, fairies are opting for higher density housing. That’s why you can know find so many fairy doors in Irish parks. Despite their shyness, fairies do like to know if people will welcome them or not. One way to show the fairies you respect and welcome them is to put a little fairy home in your garden or add a fairy door to your home. Fairies are magical, beautiful and touch moody. That makes them a very fitting symbol for Irish gifts, although leprechauns have really cornered the market there.